This is a light and airy dessert. Little, fluffy meringue cakes topped with homemade Whipped C.R.E.A.M. and fresh fruit. 2 cups of Whipped C.R.E.A.M. Place your egg whites and salt in a very clean glass bowl or pyrex pourer. In a small bowl, mix together cornstarch and sugar. In another small bowl, mix together white vinegar and vanilla. Line a baking sheet with parchment paper. Now we're ready to whip it real hard, whip it whip it real hard. Using wire whisks in your stand mixer or electric hand mixer, begin beating your egg white and salt mixture on the low-low setting. Steadily turn up, increasing speed from low to medium to high. The whites will get frothy and then turn to soft peaks. Once the egg whites have reached soft peaks, start adding your sugar and cornstarch mixture, slowly (2 Tbsp at a time), while beating on medium-high speed. Once all the sugar has been added, continue beating until the egg whites hold stiff peaks, this could take up to 5 minutes. Add the vinegar and vanilla mixture to the egg whites. Beat for another 30 seconds. Using about 1/3 cup for each mini pavlova, scoop the meringue onto the parchment lined baking sheet. Be sure to leave about 1 inch between each meringue. 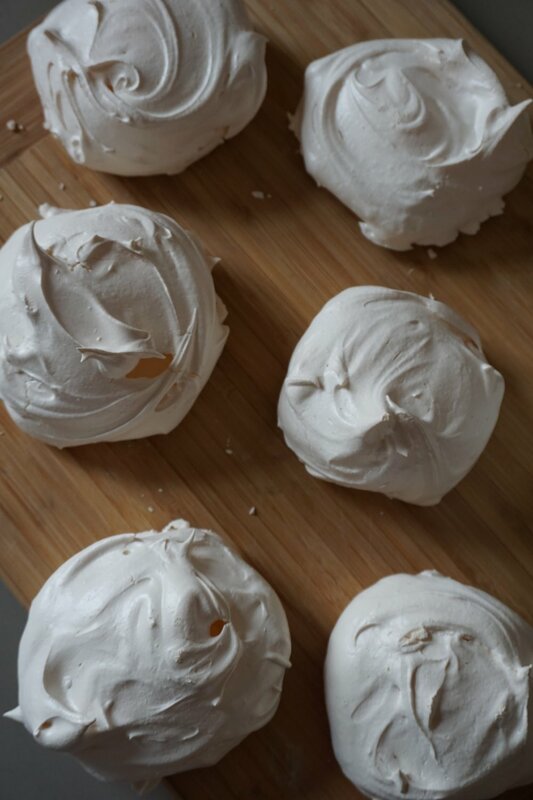 Gently shape the meringues into nests. Make a slight indentation in the middle with the back of a spoon. Place baking sheets on one of your oven's lower racks. Bake for 45-50 min. You'll know they're done when the outside shell starts firm up, is dry to the touch and they are just starting to get lightly golden. Turn off the oven, leaving the pavlova inside. Cool for 1-2 hours. To store the pavlova shells, place them in an airtight container on your kitchen counter. They'll keep for several days. Just before serving, top the pavlovas with Whipped C.R.E.A.M. and sliced fresh fruit.